For Girls & Boys ages 10 to 17. Rena will coach practice sessions once a week. Practices will train you in beach volleyball skills. Every attempt will be made to partner you with someone so that you can enter beach tournaments through CBVA. You will also be instructed in how to register for CBVA as an athlete and how to choose your own tournaments. 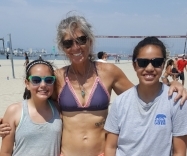 Beach promotes relaxed atmosphere, personal responsibilities, cooperation, communication and all around volleyball skills. At all tournaments there is NO COACHING allowed by coaches, parents or players. Beach requires all athletes to be self sufficient and responsible. You will be taught beach rules and strategies. CBVA: Registration per athlete is about $75 and each tourn is $60. This is up to you, your schedule and your finances.